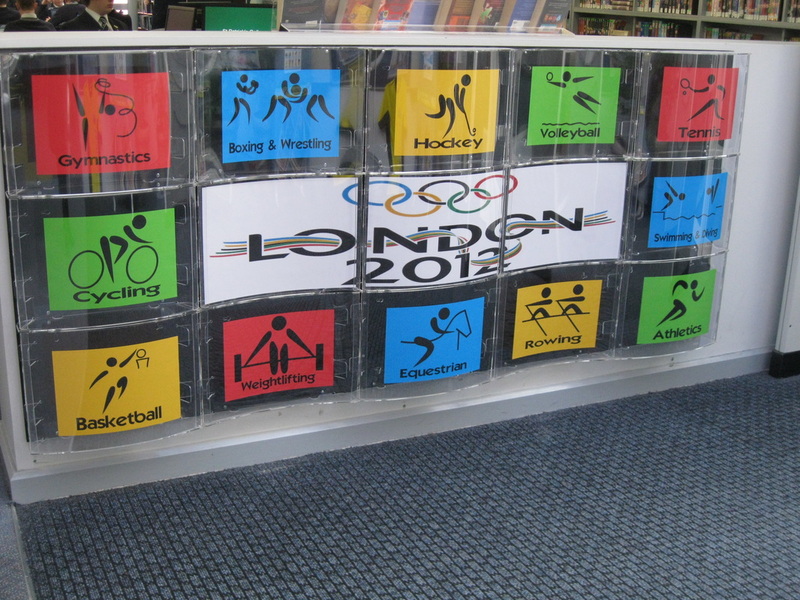 Here are some suggestions of how to put displays together with an eye on the time and purse strings. Even great displays lose their “wow” factor over time prompting the need to keep updating them, so they should be quick to create. 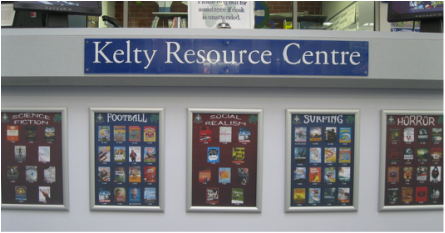 You need a colour printer, MS Publisher and a good “reserve” function on your Library Management System (LMS). 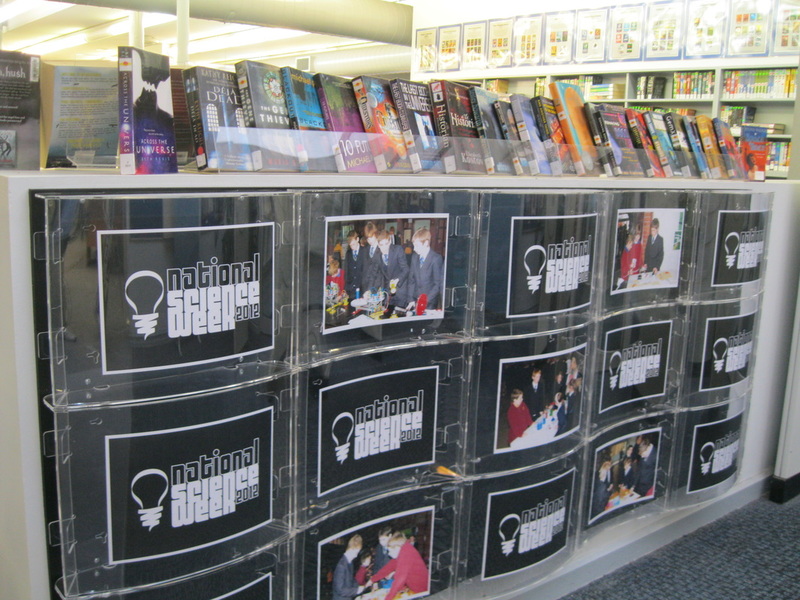 This page will focus on A4 and A3 displays – nothing 3D, no glue guns or trips to Spotlight, just colour, a little creativity and your copier. 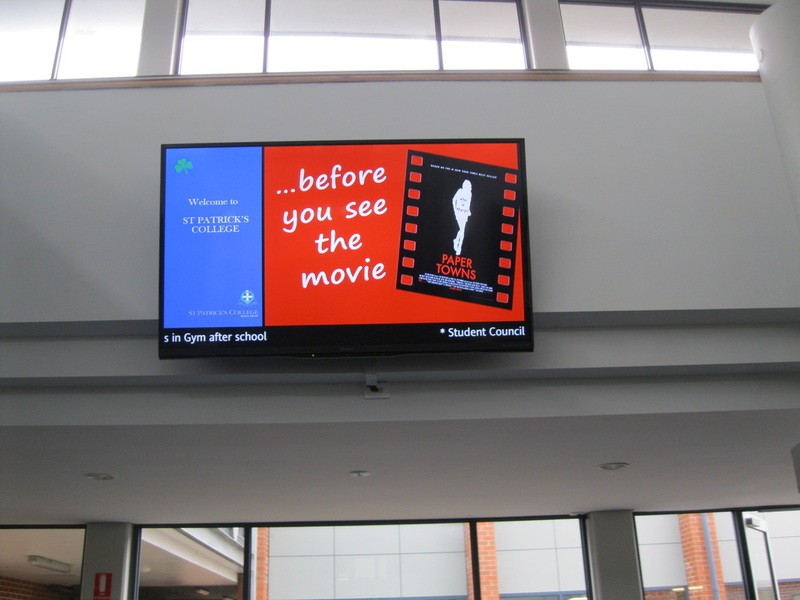 There are several factors that will make your displays impressive, current and manageable. Create a library logo to represent your library. 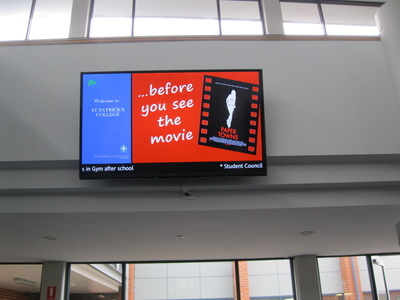 You want people to see the source of the displays, especially for posters around the school, electronic signage and online content. 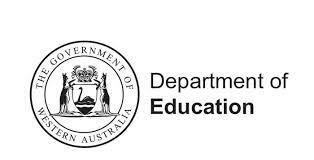 Consider using an aspect of the school’s emblem, symbol or colours in some way. It will show the viewer that the library is an integral part of the school actively serving its community. Learn how to use MS Publisher – it’s very similar to MSWord. 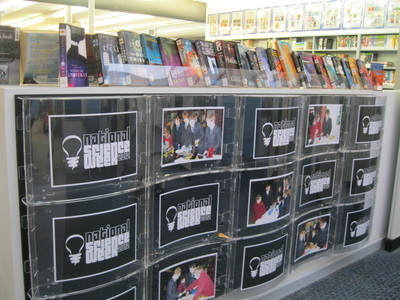 The majority of our displays are created in Publisher. 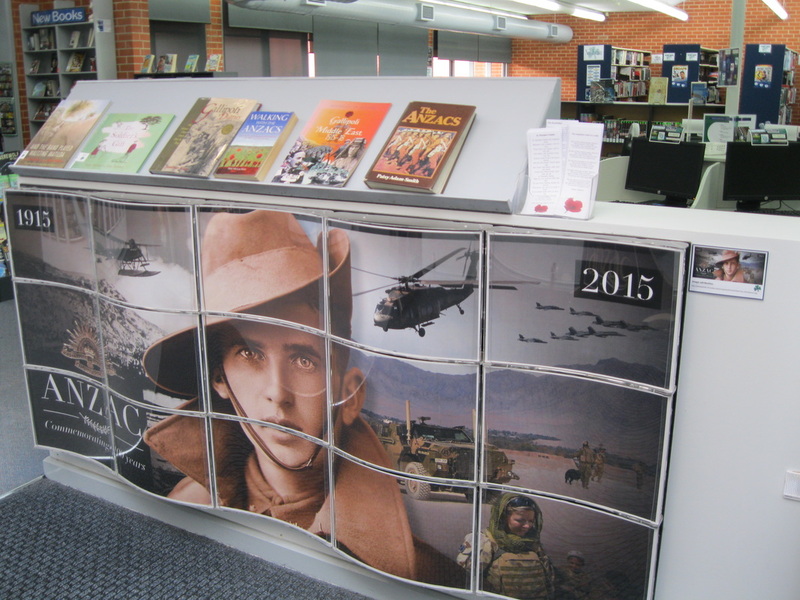 We set up templates for different types of displays and once we have them right, it really doesn't take much time to change the theme, subject – display. Many schools have Photoshop, Corel and talented students who know how to use these programs. The trick is organising them to do the work for you….sometimes it is faster to do it yourself rather than always relying on other people. There will be places in your library that are perfect permanent display areas. 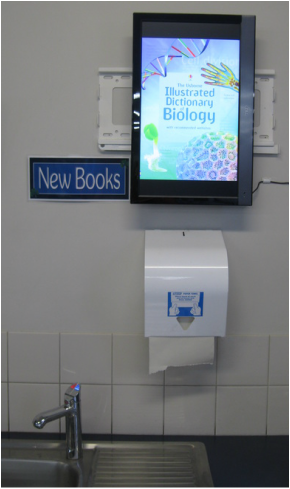 For us it was the entrance and around the circulation desk so we invested in some serious display hardware. 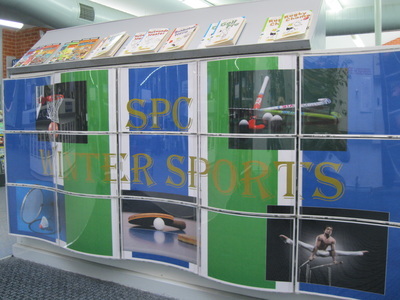 “Wavy boards” – These are A3 Wave Perspex display windows. We have fifteen that are horizontal and twelve vertical. The initial setup was expensive ($65 each) but they have been a really good investment. They are now four years old and still look new. These were sourced from Resource Furniture in Adelaide. Each window holds an A3 or A4 piece of paper to create the display. 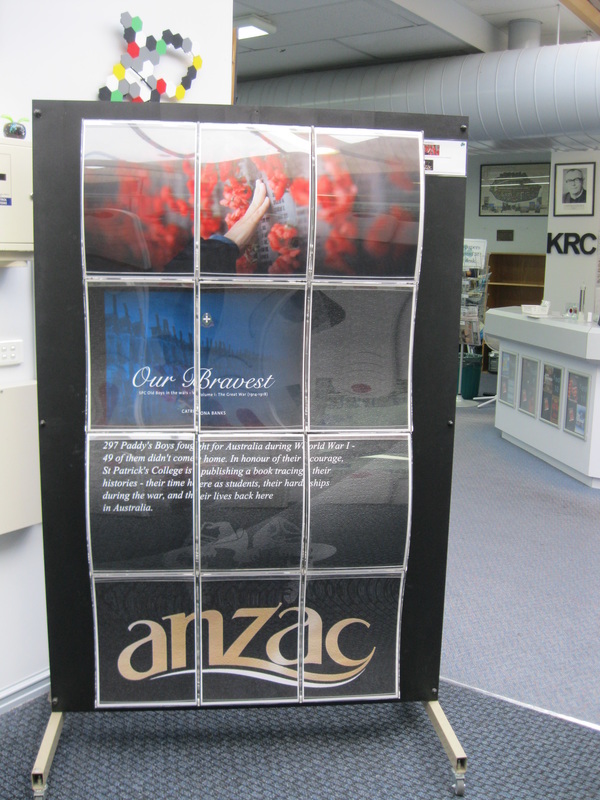 It takes a matter of minutes to change a display and because of the size, the “wow” factor is immediate and striking. 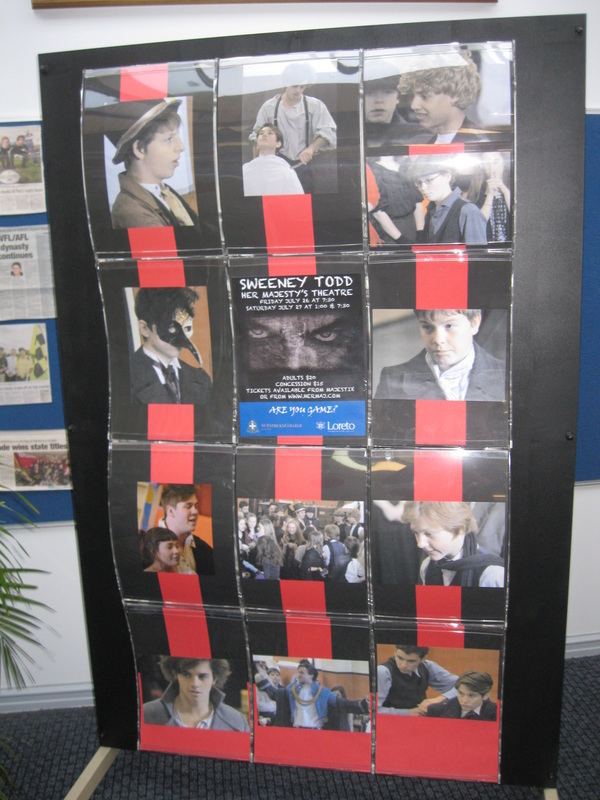 We have templates for both boards and can create a poster over the 12 or 15 windows. Sometimes we simply create one A3 or A4 poster and make multiple copies. The repetition of a poster can also be very effective, even in black and white. 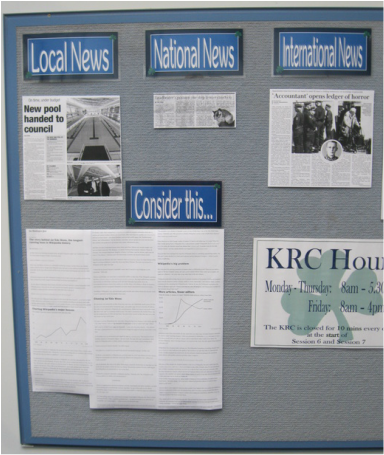 The wavy board display ideas are planned for each week of the term and are changed every Friday afternoon. 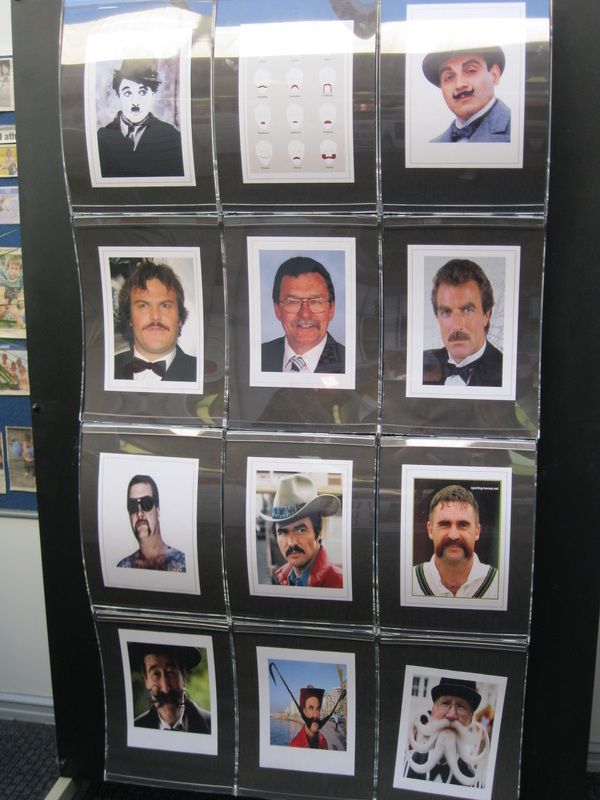 Promoting Movember. One face is particularly famous to our community. Promoting different winter sports for boys to join. Yes, 2012 but look the display windows haven't aged! Note repetition of black and white image. 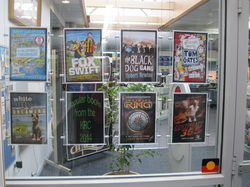 A4 Cable window displays –like the ones in real estate agencies. No more boring entrance window, we now display different collections of book covers without losing our line of sight to the locker area. A4 Cable window displays - allows passive supervision. A3 Clip Frames –like the ones in shops. These are around the base of the circulation desk. 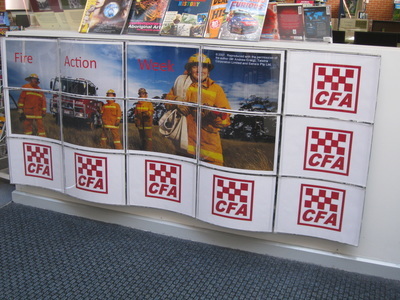 While we could have had laminated posters there we felt the area needed something a little more substantial. They are attached to the desk with heavy duty Velcro making it easy to remove and update. Laminator – A3 Never underestimate the power of the gloss. Laminating an A3 or A4 poster instantly gives it authority and a professional air – especially with your well placed logo and a consistent colour scheme. If it’s a poster that you are going to place in a classroom, it may need a bit of added protection and durability. 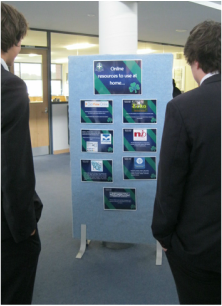 Secondary classrooms often have empty pin up boards – they are great places to promote our resources and services. 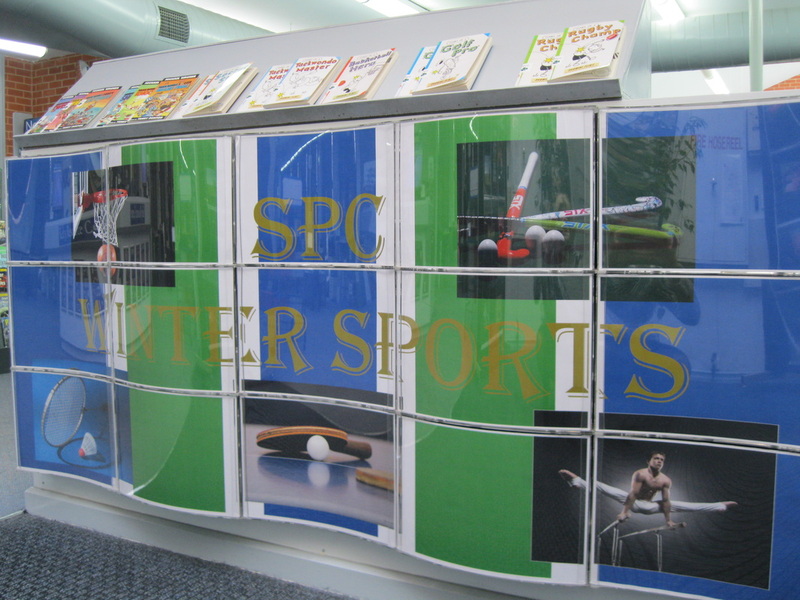 A page of library display images. Use the “search tools” function in Google and choose medium or large in the size option. You have to sign up to use this site but it is worth the trouble. You do have to be over 18 to use it. 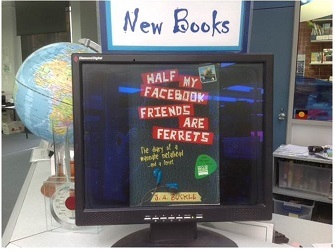 It’s useful to make a Pinterest board for your library team to share. You can add photos of good displays you’ve seen and search Pinterest to see what others have pinned. 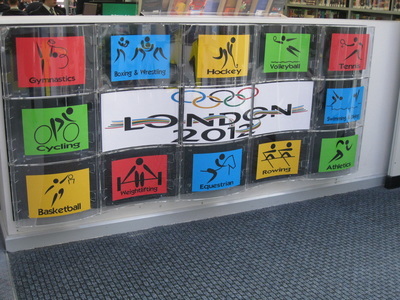 Flickr also has a huge range of library display images for ideas. Try this Informania site for some great links. Some books walk off the shelves themselves. Others need a little promotion. Pam Delahunty suggesting a good read. 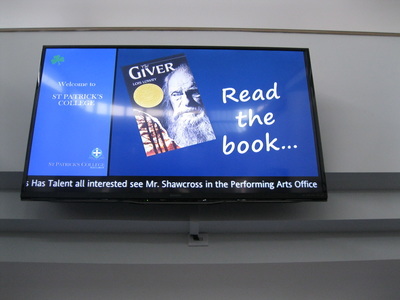 Make use of the electronic signage around the school. Promote new books wherever people are waiting. In the staff room we promote any new resources that we think will appeal to teachers. Give parents something to read while they are waiting to see teachers. The school is very lucky to have hard working and creative library staff. Use data from your LMS to create posters of your most popular titles, highlighting various collections, subjects areas and genres.